Bertha Rowell died in 1938 after a very long illness. She had worked long, hard hours for many years building the Rowell Ranch, the stock contracting business, and the meat packing business. Harry married Maggie Tyron, a beauty shop operator from Chicago. She was a hairdresser in Reno and met Harry during the Reno Rodeo, where Harry was the stock contractor for many years. They married not too long after Bertha's death. Elizabeth was sick for a long period of time. She, like her mother, worked long, tedious hours for many, many years building the Rowell Ranch, the rodeo stock contracting business, the saddlery and the meat packing business. Elizabeth Rowell Leuschner died in 1957, a few months after her daughter Harriet married Leon Beauregard of Castro Valley. Elizabeth never knew any of her grandchildren. 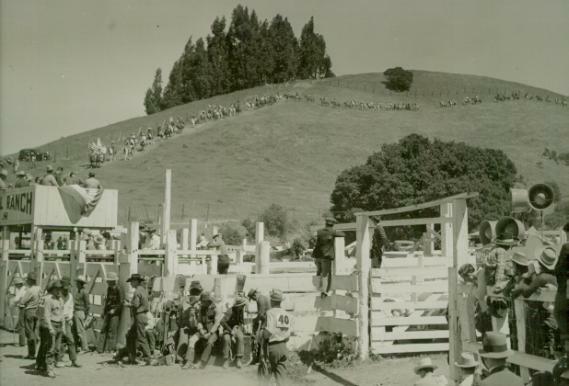 Harry Rowell died in August, 1969 at his beloved Camp Bertha in the Sunol Hills. Shortly thereafter his death, Maggie banned Harry & Bertha's granddaughter Harriet and Harry & Bertha's great grandchildren, Sonny, who was 11 years old at the time, Desiree, who was 9 years old at the time and Paige who was 6 years old at the time from both Camp Bertha and the Main Ranch in the Dublin Canyon. None of Harry & Bertha's descendants were allowed back on either ranches. Maggie Rowell died in 1975. In her will she left a small sum of money to Harry & Bertha's descendants with the stipulation that if any of Harry & Bertha's descendants contested the will, they would lose what little she had bequeathed to them. Maggie had appointed a couple of Executor's of her estate, none of which were Harry & Bertha's descendants. Matter of fact, both of them were employees of Harry Rowell's. These Executor's claimed to be great friends of Harry Rowell and a matter of fact, Harry at sometime or another had helped them. Camp Bertha was sold for $175 per acre to the East Bay Regional Park District. The Executors of Maggie's Estate were given Life Estates at Camp Bertha. The Rowell Ranch in the Dublin Canyon was put up for sale shortly after Maggie's death, and a group of Harry & Bertha's friends, representing Sonny & Desiree, tried to purchase the Rowell Ranch. However, when they arrived at the lawyer's office to make an offer, they were all told that the ranch had already been sold to the Cronin family. The Rodeo Arena was to be given to HARD on a 99-year lease. 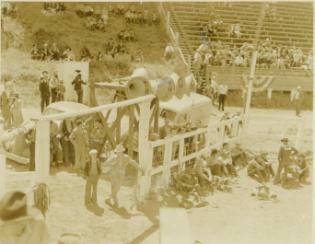 However, the Rodeo Arena was eventually sold to HARD. Harry, Bertha and Elizabeth had left a legacy of their lives on both ranches. All the saddles, trophies, gun collection, pictures and personal items were never given to any of Harry & Bertha's descendants. This included Elizabeth's personal effects, including her prized silver parade saddle that Harry had had made specifically for her by the Rowell Saddlery. Harry & Bertha's descendants were never given or offered any of the personal items that were in the Ranch Houses at the time of sale. So needless to say the fruits of Harry, Bertha & Elizabeth's labor were never passed down to their descendants. To this day, none of the descendants really know what happened to any part of the Rowell Ranch. One has to believe that if Harry, Bertha and Elizabeth were alive today, it would greatly pain them to see that their legacy of hard work, pride and tradition was no longer and that none of their descendants benefited from their legacy or had the opportunity to keep their legacy alive. 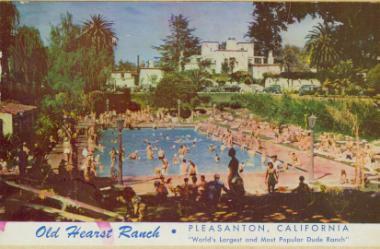 The Old Hearst Ranch in Pleasanton, California was actually the Apperson Ranch in Pleasanton. Apperson's daughter married William Randolph Hearst. 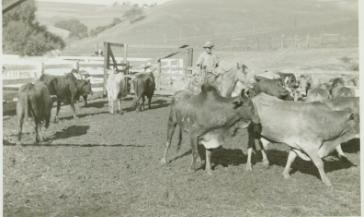 The Rowells and the Apperson ranches were next to one another and the Appersons and Rowells gathered and worked cattle together. This property was sold to the federal government and the Federal Women's Prison was built on it. In the late 1970's the Apperson's granddaughter Patty Hearst was a resident of the Federal Women's Prison. She resided in a Federal Prison that was built on land once owned by her grandmother's family.